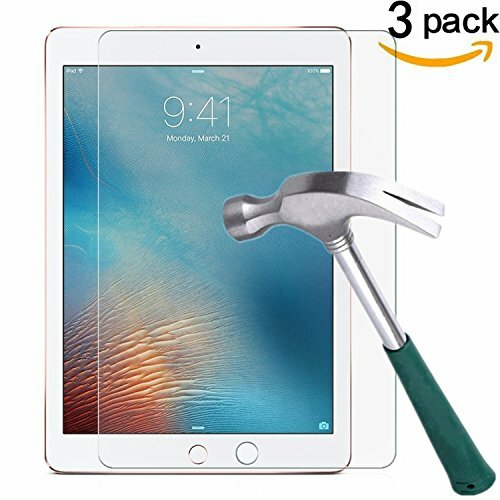 This screen protector fit from TANTEK is for: Apple iPad pro [9.7 inch](2016 version) / iPad air 2 / iPad air only, not fit for iPad pro 12.9 inch and other tablets. Please note: Due to the round edge of apple iPad pro [9.7 inch](2016 version) / iPad air 2 / iPad air, the screen protector will not cover the full screen, but only the flat area. Perfect design perfect protection: Featuring maximum protection from high-impact drops, scratches, scrapes, and bumps. Protects against sweat and oil residue from fingerprints best way to maximize resale value bubble free installation best touch screen accuracy hd display clarity There are unremovable bubbles during the installation. The screen protector suffer wear and tear during normal use (not including water damage or damage caused by abnormal use). If you have any questions about this product by TANTEK, contact us by completing and submitting the form below. If you are looking for a specif part number, please include it with your message.